On Valentine’s Day, The University of North Carolina System released “Leading on Literacy: Challenges and Opportunities in Teacher Preparation Across the University of North Carolina System.” For me, it was not love at first sight. “Leading on Literacy” represents the latest effort by the UNC System to address the shortcomings of teacher education programs generally and literacy instruction particularly. According to its authors, the purpose of the report is to examine how teacher training programs can address the unsatisfactory performance of North Carolina students on federal National Assessment of Educational Progress tests and persistent achievement gaps between student groups. The concern that both will impede economic growth in the state underlies their inquiry, but the report does not include statistics outlining the purported implications of mediocre academic outcomes on the state economy. School teaching undoubtedly requires skilled ability, and skilled ability is found where there has been scientifically arranged training. Modern developments in the field of education—statistical studies, standardized tests, surveys, and most important of all, classroom experiences—have served to demonstrate that teaching, when properly achieved, is decidedly a professional activity, and as such—just as in the case of any profession—demands a prolonged period of intelligently planned preparation. Teaching is a high-skill, high-stakes job. 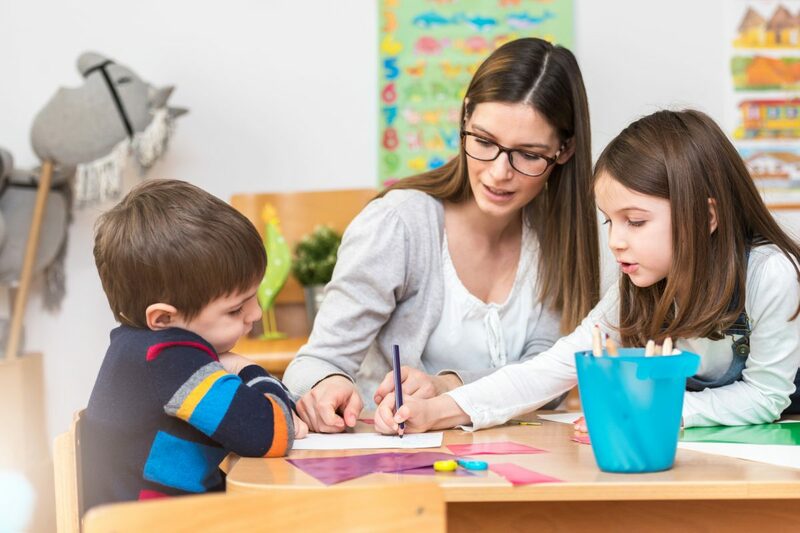 We must treat it as such, recruiting talented teacher candidates and enabling them to succeed by providing an education that stresses evidence-based strategies and interventions. That education should also include plenty of opportunities to learn and hone their craft early-on through meaningful student teaching experiences. Both Noble and Spellings define teacher education as the systematic acquisition of skills driven by empirical research based on analyses of standardized testing data and reinforced with practical classroom experiences. According to this model, knowledge of subject matter and the acquisition of a truly liberal education are ancillary concerns and occur in academic departments often disconnected from the education school. The value of formal teacher training, state endorsement of that training through licensure, and exclusion of those without training or licensure are rarely questioned. But such a framework does not always agree with the research. Over the last decade, Kevin Bastian, Gary Henry, and other education policy researchers have examined the relationship between student test score growth and teacher characteristics in North Carolina public schools. In “Staffing North Carolina’s Classrooms: Connecting Teacher Preparation to Student Outcomes,” Bastian and Qi W. Xing examine the distribution, characteristics, and performance of teachers based on the origin of their training. The following charts from that study compare teacher performance using UNC System teachers as the benchmark. 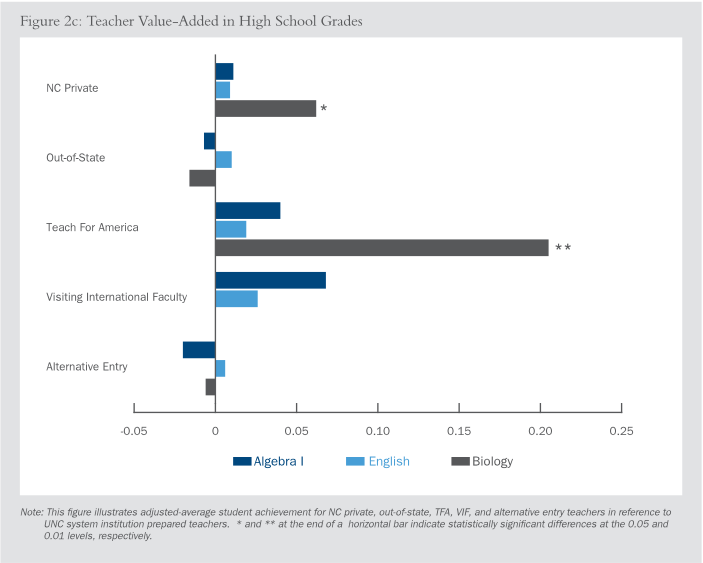 In most subjects and grade levels, teachers prepared by UNC System institutions outperform teacher education graduates from private institutions in North Carolina, teachers prepared by out-of-state universities, and teachers who obtain a license via an alternative or lateral entry program (which allow qualified-but-unlicensed professionals to obtain teacher certification). 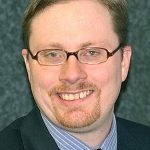 But complicating matters for proponents of university-based programs is the fact that several programs that bypass education schools, such as Teach for America (TFA) and Visiting International Faculty (VIF), graduate teachers who generally outperform all others. This includes teachers from the UNC System. TFA recruits top-notch college graduates, most of whom do not have an education degree or state certification, to teach in low-performing or low-income schools for two years. VIF pairs public schools in the United States with college graduates who have earned a teaching degree or license from a non-American institution. VIF teachers may teach in the United States for a maximum of five years due to visa restrictions. 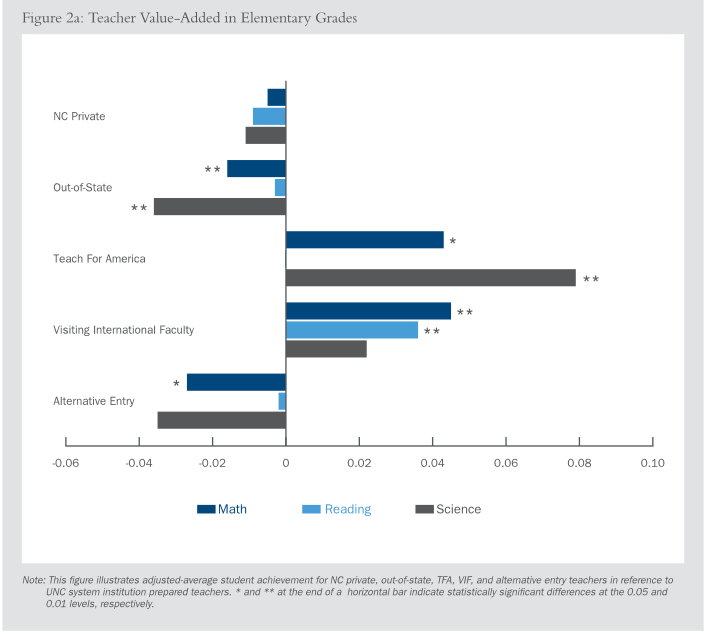 In North Carolina, TFA teachers tend to outperform most other teachers in elementary, middle, and high school math, reading, and science. VIF teachers excel in elementary reading and math. Unfortunately, both limit the number of years that participants may remain in the program and supply a very small percentage of teachers in public schools. How then is it possible that Teach for America and Visiting International Faculty teachers are often the most successful in North Carolina’s classroom? Even if teacher education programs raised admissions standards, it would take more than improvements to the education schools in the UNC System to raise student achievement in the state’s public schools. The UNC System supplies only 37 percent of the employed teacher workforce in North Carolina. The remaining 63 percent received their training elsewhere. That is a good thing when the teachers come from Teach for America and Visiting International Faculty programs, but they only represent around 2 percent of the workforce. In the end, it is unlikely that “Leading on Literacy” will be a catalyst for the adoption of much-needed reforms in teacher education, let alone spur improvements in the quality of public schooling. The authors’ recommendations deal mostly with course content in teacher education and programmatic concerns, such as the need to “help facilitate early, deliberate, scaffolded, and aligned field experiences” and “Work with [educator preparation programs] to review all courses in each program, paying particular attention to the sequencing and depth of literacy courses.” In fact, nearly all report recommendations are broad, peppered with jargon, and rarely mention the costs or resources required for implementation. Simply put, the authors did not “rock the boat” by, for example, recommending that the UNC System adopt National Council on Teacher Quality’s (NCTQ) rigorous standards for educator preparation. It should come as no surprise that NCTQ’s first recommendation is that states “should require teacher preparation programs to admit only candidates with strong academic records.” According to NCTQ’s 2017 State Teacher Policy Yearbook, North Carolina is one of 19 states that “partly” meet this goal. In addition, North Carolina is one of 15 states that do not ensure that elementary teachers trained in North Carolina have “sufficient content knowledge of all core academic subjects.” The content knowledge of middle and high school teachers fares slightly better in the NCTQ evaluation. Teach for America, Visiting International Faculty, and the National Council on Teacher Quality point the way forward for teacher training in North Carolina. The question remains whether UNC System leaders will have the courage and commitment required to overcome the political and institutional barriers that have undermined past reforms.